And so it ends. Our long 2015 40th anniversary year concert season ended with our final concert at St. Mary’s church last Thursday. Considering the holiday season is mainly over we had a reasonable audience although not to our normal summer levels. However, we still tried our best to entertain and it was well received. Musical director “Wilbur” Williams is fond of reminding us that we are only as good as our last concert and so I guess this is how good we are. We haven’t had our “Wilbur” mark out of ten for this concert yet but suffice to say that he looked happy enough especially with Benedictus. This is a new song for us this season and very popular with the choir and the audience. It is a lovely song to demonstrate the harmonies of a male voice choir. Principal soloist Paul Varallo sang Anfonaf Angel (Guardian Angel) this song has been sung by a number of people but a popular version is by Welsh bass-baritone Bryn Terfel with backing from the Welsh National Orchestra which was made to support the Wales Air Ambulance, a cause which we, along with other local, choirs raised funds for last year. It can be purchased on their web site. www.walesairambulance.com and makes a fine addition to a CD collection with our own CD Hywl a Hiraeth available via our very own website. Paul also sang Holy City both songs receiving sustained applause. This final concert also featured two support soloists, Duncan Hilling singing the opening and closing lines of The Fields of Athenry and Tom Pearce with Home on the Hill as part of a trilogy of Welsh songs starting with Calon Lan and finishing with O Gymru..
A local man who wishes to be anonymous. Our grateful thanks go to everyone who bought a ticket, many of them local people during our days selling them outside Sainsbury’s but the addresses of the prize winners also shows how many people from far and wide come to our concerts and bought tickets. We are also grateful of course to the local businesses which provided the prizes without which the raffle could not take place. Clearly Saundersfoot, Tenby’s little neighbour, has demonstrated that small though it may be, its generosity is large. Thank you all. 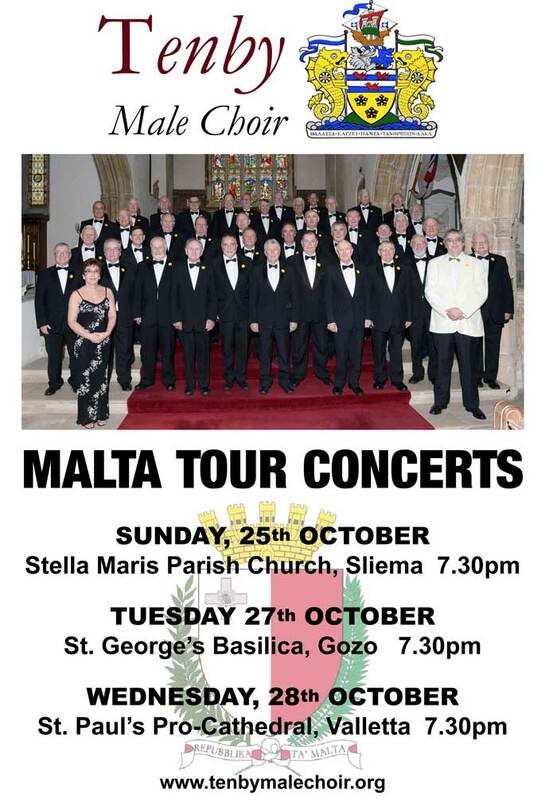 In a couple of weeks then we will fly to Malta for some rest and relaxation although we have three concerts booked in major venues in Malta so it won’t be all play. We want to put Wales and Tenby on the map in Malta as we have done on so many other occasions and places. Between now and then we will brush up on some of our more religiously inclined songs which we are led to believe will go down a storm over there and of course learn the Maltese national anthem in Maltese a language descended from Siculo-Arabic and so mildly challenging with a fortnight to go. The choir website is at www.tenbymalechoir.org and you can read or even add to our Guestbook from the home page. We also have a Facebook account if you want to be one of our Friends. Tenby Male Choir – Lions and a Maltese Falcon?